I had the pleasure of giving an artist talk on November 10th at Art Intersection (AI) thanks to an invitation from Alan Fitzgerald, AI’s founder. It was exciting, and yes, a little nerve wracking, but the members were very kind and supportive as they listened and looked at my slides. I’m grateful to everyone who came out and really enjoyed the interaction and questions after the formal presentation! 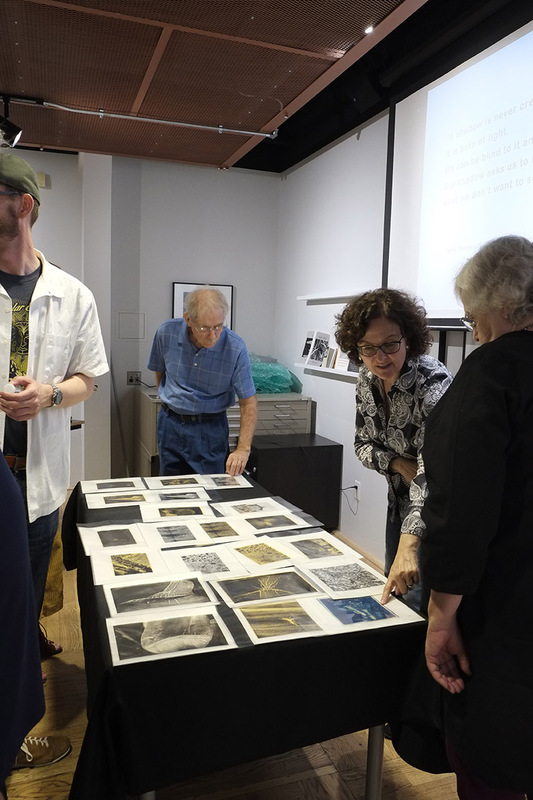 I showed my newest work – three bodies of pigment prints on vellum over gold leaf. The most developed to date is called “Awash” and explores mourning/grief through images of water and objects in and near water. The second project is just getting started and is called “The Pilgrim’s Path” at this point. These images were inspired by my May trip to Benabbio, Italy with Alchemy Studio. I ended the presentation with a sneak peak of “Geology of Spirit” (a photo-poetic collaboration set to open March 9, 2019). At the podium, screen on, about to start the talk. The framed pieces on the easels are from the Geology of Spirit project. Talking with everyone and answering questions after the presentation was the best part.